Lightwaveseeker: Catalonia Voted. Once the British Colonies Voted. Do Humans Have the Right to Leave Their Nation? It's an interesting question and one which doesn't seem to have an easy answer. Most governments nowadays take the position that existing borders are sacrosanct regardless of historical and cultural realities. That's clearly untenable as an across-the-board rule because there are many cases of secession that almost everyone now accepts as legitimate -- for example, the American colonies leaving the British Empire, the Baltic states seceding from the USSR in 1990, Third World colonies breaking away from British and French imperial rule in the mid-twentieth century, etc. I tend to think each case should be judged not based on some general rule about secession, but on how the individual case would affect human freedom. So, for example, seceding from an authoritarian state to create a democracy (Baltics 1990, for example) would be just, but seceding in order to preserve slavery (Confederacy 1861) would clearly bu unjust. The US in 1776 was justified by this criterion since it created a representative government for people who had not been allowed democratic rights under the previous imperial rule (the 13 colonies had no representation in the British Parliament). Catalonia is actually a very difficult case to judge under that or any other criterion. 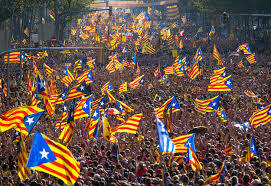 Spain is a democracy and an independent Catalonia would be a similar one, so the level of individual freedom would be about the same either way. It's not clear that the majority in Catalonia even wants to leave, given the low turnout in the referendum (though that was the Spanish government's fault for trying to suppress the vote), and earlier polls had shown a majority for staying with Spain. On the other hand, the government's brutality during the referendum and its efforts to suppress Catalonian autonomy now are arguably violations of human rights and may well be turning Catalonians against Spain -- so the government, by the very act of suppressing independence, may be creating the conditions that justify it. A clearer case is Kurdistan, where events have been running parallel in time with Catalonia. The Kurds have suffered terribly under Iraqi rule over the years, so much so that expecting them to reconcile themselves to staying permanently part of Iraq is asking too much. The history of the KRG suggests that in independent Kurdistan would be more competently run and probably better at protecting human rights than the Iraqi state is. Overall I think it's not possible to come up with a blanket verdict that secession is always right or always wrong. Each case has to be judged based on how it would advance or retard other, more fundamental values. Thanks for your in depth analysis and reflection. Much appreciated. Generally, I favor the right of people to vote to leave a government. That's what human rights and democracy is all about, HOWEVER, I do agree that there is a danger of fragmentation which accelerates. That seems to have been the case in the "whiskey rebellion" which took place shortly after the American Revolution. I know that Madrid's current government is quite a bit different from Franco's reign, but still Spain's central government's has a bad mistreatment of Catalonia in past history and the national police's violent attack on people just trying to exercise their right to vote is scary. Overall, I am not sure why Catalonia is even seeking complete independence. Besides, there is the real significant fact that a large minority, or possibly a slightly larger majority of Catalonians, (especially people who have moved there in the past from other areas of Spain) are actually against the secession. I strongly agree with you about Kurdistan! Though even there, it's difficult because some Kurds kill innocent people in their bombings against Turkey. I have even more to say, partially in response to your powerful comment, but think I will instead post it as a second blog post.